`Anatomy of decline – the Young Communist League (1966-1980)’ – a 53,000 word study first written by Graham Stevenson in 1985. 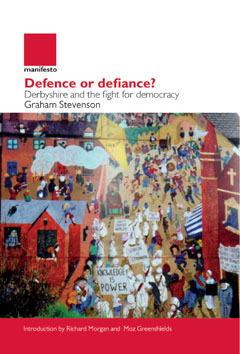 `In Defence of History’ (2004), an 80,000 word study by Graham Stevenson of classical Marxist historical theory in the context of modern scientific evolutionary, psychological, anthropological, archaeological and historical knowledge; in which conceptions of patriarchy, class rule and development are shown to be the consequences of real life. Graham Stevenson’s `An illustrated guide to trade union history’, with downloadable pictures (further developed in 2001 from a 1980 project). The complete memoirs of three Communists – are also published here. i.e. `No wonder we were all rebels – an oral history’ by Jock and Betty Kane (1992 – 34,000 words). 1946 YCL congress; 1961 YCL congress; YCL in the 1950 general election; Clarion cycling club 1922; engineering shop stewards national conference 1944; Communist student branches 1963-64; the wartime links between Coventry and Stalingrad.